This week Absolut unveiled an inspiring project was unveiled that celebrates global unity. Seven artists in seven countries around the world came together for a common cause of positive action. Over the course of a single night, local artists worked in their respective neighborhoods on a series of murals to inspire one another and people in their local communities to live in a more open and inclusive world. In a short film directed by renowned visionary, Aaron Rose – each artist created a mural with their vision of a better tomorrow in Brazil, Canada, China, Germany, India, The UK and The US. Working from sunset to sunrise, each artist created their ideals for change. Visualizing themes around sustainability, gender equality, global unity and freedom of expression, artists came together across different time zones to help shine a light on a local community in each country. In the following months, each artist will lead workshops and activities in the community to give back, inspire and encourage people to come together and drive change through creative expression supported by Absolut. Each piece of art can be bought online with all profits going to support these local initiatives. Panmela Castro, Brazil’s representation, uses street art as a platform to raise awareness for women’s rights. In her home of Rio de Janeiro, gender inequality is widespread with its effects being particularly exacerbated by a lack of public investment in education and safety in neighbourhoods such as Catete. Her fierceness and pride have resulted in her current reputation as Brazil’s “graffiti queen”, having been listed as one of Newsweek’s 150 Women Who Shake the World and noted as a Young Global Leader by the World Economic Forum. In #ANightForChange, Panmela’s artwork depicts her vision of a better tomorrow where we bring women to power through unity. Central to the concept is the notion that empowering women creates a more equal society overall, making it not just a women’s responsibility but everyone’s responsibility. Absolut will support Panmela’s community initiative, Rede NAMI, in providing graffiti workshops to empower Afro-Brazilian women in underrepresented communities in their #AfroGrafiteiras project. Vancouver based Emily Gray’s work consists greatly of community based art, as her mission is to empower people through the creative process. Gray creates dynamic compositions that allow viewers to flow through the paintings and experience art on a larger scale. She collaborates often with a diverse group of fellow artists as well as members of disenfranchised communities such as those found in Downtown Eastside Vancouver, where “82% of visible minorities say they have experienced prejudice or some form of discrimination” (Vancity, 2017)1. In #ANightForChange her artwork portrays her vision of global unity as a cosmic cobweb, representing the strength of the connection between humankind from a molecular to a cosmic level. Absolut will support a community program of Emily’s design providing materials to plant a community garden with immigrants and refugees in the area in collaboration with a new housing project of the Immigrant Services Society of British Columbia (ISSBC). The garden will host numerous varieties reflecting the cultural diversity of the community, and its harvest will contribute the ingredients for a communal dinner with dishes from all around the world. Fansack is one of a handful of active artists in Chengdu’s graffiti community, who has worked to establish a reputation as one of the most important artists in the city. In Chengdu, population and economic growth have increased at a rate faster than the residents and the environment can keep up with, visible in both its congestion and pollution. In #ANightForChange Fansack shines a light on the beauty of the relationship between humanity and our natural surroundings, bringing it to life in his vision of a better tomorrow. Absolut will support a workshop of Fansack’s design in collaboration with the A4 centre in Chengdu. The A4 Centre is committed to promoting contemporary Chinese art, boosting the development of urban culture and art to effectively enhance cultural and artistic exchange. Fansack will lead workshop in 3D sculpting using recycled materials to encourage participants to engage in the topic of waste production and question their contribution to it in a creative way. Ibo Omari, a Berliner of Lebanese and Turkish heritage, was motivated by right-wing hate to transform neo-Nazi graffiti into playful images, effectively neutering a symbol that haunts Germany. His NGO, Die kulturellen Erben e.V. works to bring together the residents of Kreuzberg through urban contemporary art. In #ANightForChange, Ibo initiated artists Poet73 and Gris to unite not only their community, but their respective graffiti and VR art styles, in their vision of a better tomorrow. Their artwork looks to revive the connectedness Berlin’s various immigrant groups once had. As we approach German Unity Day (Tag der Deutschen Einheit) on October 3rd, it further celebrates Berlin as an icon of the strength that comes with a united community. Furthermore, Absolut’s support in improving Kreuzberg through Die kulturellen Erben e.V. will make new workshops a reality that Ibo has been keen to pursue, bringing them “to the 21st century” as they provide community members with an opportunity to experience and learn about the potential of VR in an urban art context. Formally trained in fine art, Avantika uses surrealism as a means to portray what is beyond our conscious perspective. With her art and activities under the alias Womenpow, she wants to encourage women empowerment and help women evolve into the best beings they can be. In her city of Mumbai, where gender roles and inequality remain prevalent, the spectrum of crimes committed and discrimination against women continues to increase. With #ANightForChange, Avantika portrays a better tomorrow whereby all elements of the female charisma are combined as a show of strength. Following on from her art, Absolut will support her collaboration with local artists to provide art therapy to women in the community. Liverpool based street artist Beta Rok 75 creates bold and vibrant works on the walls of the city. Many of his murals are designed–sometimes with help from locals in the community –to brighten up inner city areas such as Toxteth. For many who feel that their socioeconomic status deprives them of a voice, his art and community work provide a channel through which they can express themselves. In his collaboration with this project, Beta Rok 75 has set out to bring a wave of positivity to Toxteth’s residents in his artwork, as a reminder to look onwards and upwards towards a brighter tomorrow. As a follow up to his artwork Absolut will support him in organising a neighbourhood arts festival, connecting the public in the making and viewing of innovative, forward thinking street art. Members of the public will collaborate with artists to learn from their experience and techniques in the production of a communal mural, providing a unifying creative opportunity and skill development for them. Art teacher by day, street artist by night, Fumero uses art as a freedom of expression, and provides free public events to inspire others in the community to do the same. His style is an extension of his character; bold, uninhibited, assertive and unorthodox. He is constantly active on the streets of Bushwick, both through his murals and other activities within the community. In #ANightForChange, Fumero will depict his vision of a better tomorrow in an incorporation of musical symbolism in his combination of graffiti and abstract style due to its relevance in Bushwick’s local context as a historical means of freedom of expression. Absolut will support a follow up activity with Fumero in the form of a public street art gallery. To encourage the expression of the neighbourhood’s residents the work will be exclusively made by them as opposed to from visiting artists. In its unveiling the gallery will host an open mic night as well as local DJs. 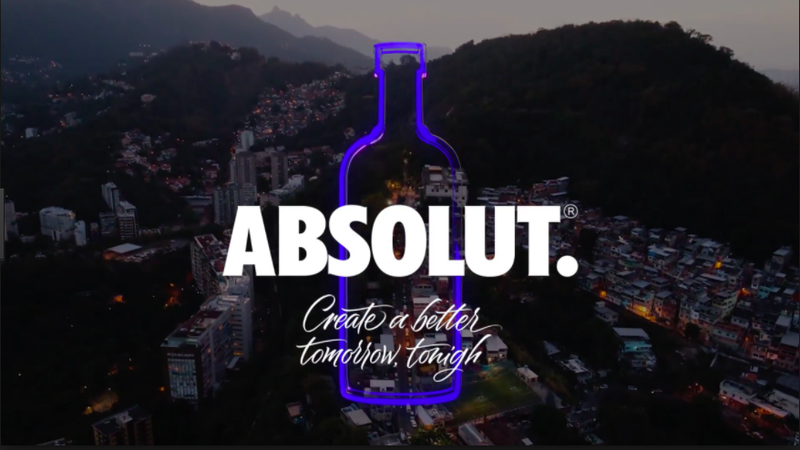 In line with its legacy in artistic collaborations, Absolut will now inspire action through creativity as a force for positive change. Since the late 1980s Absolut has collaborated with more than 550 artists, including Andy Warhol, Damien Hirst, Keith Haring and most recently Mickelene Thomas, Olivia Steel and ToiletPaper Magazine. Other notable artists include three time Academy Award filmmaker, Emmanuel Lubezki who recently created the “One Night” film to launch the new platform “Create a Better Tomorrow Tonight”.